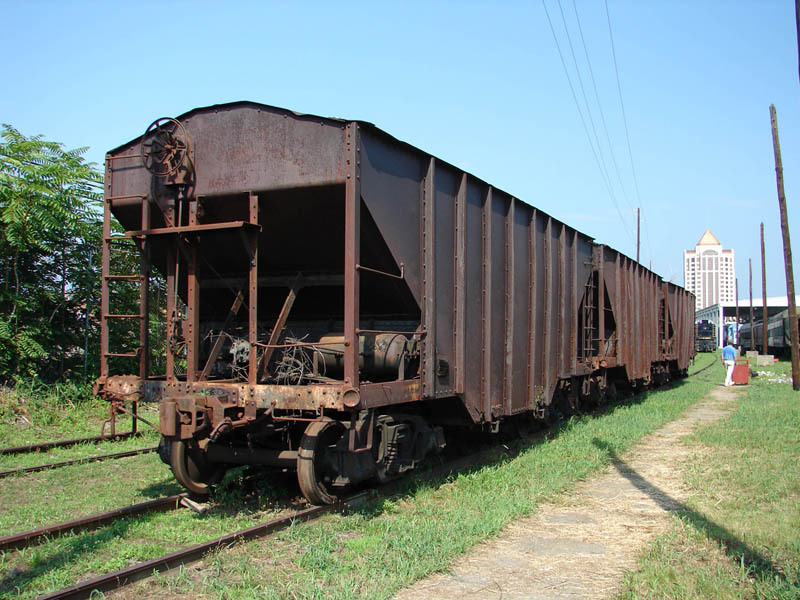 Railway Preservation News • View topic - Preserved Ralston Steel Car Co. freight cars? Preserved Ralston Steel Car Co. freight cars? Post subject: Preserved Ralston Steel Car Co. freight cars? From 1905 through 1953, Ralston built (and modified) freight cars in my home town of Columbus, Oh..
At some point, my father collected 8x10 glass plate negatives from Ralston. In my teens, I cut my black and white printing teeth making contact prints from those negatives. Post subject: Re: Preserved Ralston Steel Car Co. freight cars? There's 3 of them. They are WWI vintage, and I'm fairly positive they were built by East End Shops or American Bridge in Roanoke. N&W #54880, a box car built by Ralston Car in February of 1937. This car came to the museum in September of 1989 as a donation from Norfolk Southern and was lettered at that time as N&W MofW box car # 515020. Last year we painted and re-lettered the car with its original number and paint scheme. Nickel Plate Road gondola car #45622 built by Ralston Car in November of 1946 for the Wheeling & Lake Erie as W&LE #45622. The car was assigned NKP #45622 after the Nickel Plate leased the W&LE in December of 1949. The car was donated to the museum by Norfolk Southern in February of 1994, and it came in as Norfolk & Western #547522. The N&W had rebuilt it in June of 1965. A couple of years ago, the museum repainted and re-lettered the car as NKP #45622. The narrow-gauge Sumpter Valley Railroad has three Ralston patent side dump cars that were built for the White Pass & Yukon in 1941. They weren't built in Ohio however, they were constructed by the Pacific Car & Foundy of Tacoma Washington. Northern Ohio Railway Museum has an Ohio Edison flatcar, OEDX 100, that was built by Ralston. Today it resides it one of our carbarns with the substation equipment that we acquired from the breakup of the Trolleyville collection in 2009. This load is fitting since the car was built to carry substation equipment for Ohio Edison. Here is the data on the car. The photos of the car were taken in January 2010 on its way to the carbarn after the substation equipment had been loaded. The two surviving 1941 Pere Marquette 50-foot auto/furniture box cars at the Steam Railroading Institute in Owosso and the Tri-Cities Historical Society in Grand Haven, Michigan, are Ralstons - Nos. 72332 and 72222, respectively. If I remember correctly, the builder's photo for these shows an oval stencil with the maker's name. Ran across a photo on the internet of a steel 40' single door boxcar simply identified as number 515223. The car is at the Saginaw Railway Museum, but I've have had no luck in finding out any information on the car. The six digit number beginning 515, is similar to the number on the Norfolk & Western car at HVRM mentioned earlier in this thread, so I thought that perhaps it is also a N&W car. If so, it seems as if it also might have been built by Ralston. Anyone have any info on 515223? Does it belong in this thread?